A view of Oakmont in the early 1930s. Editor's note: Third in a series of stories about historic homes. 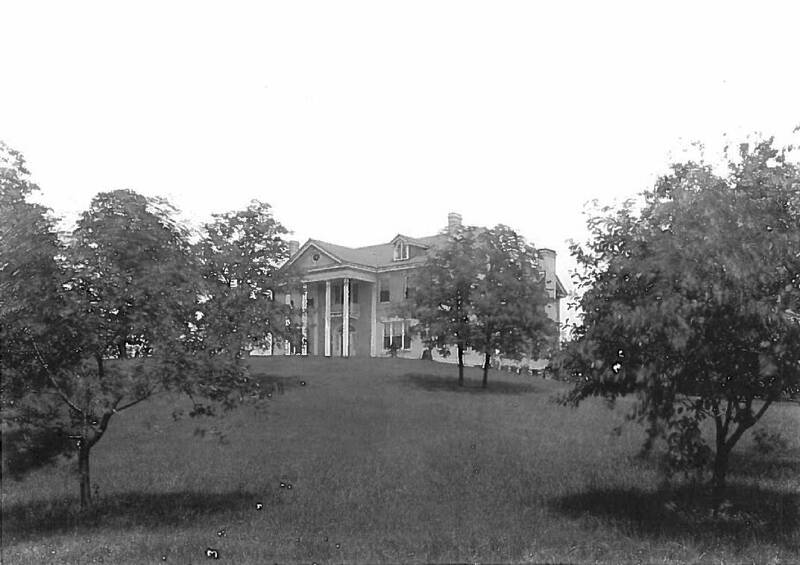 In 1925, my grandparents, Judge and Mrs. Joe V. Williams, built their grand colonial home on a hill above Dallas Road in North Chattanooga and named it Oakmont. In addition to being a gathering place for family and friends, the 40 acres served as a working farm. The front of the house had tall Corinthian columns topped by acanthus leaves adorning a yellow brick facade. The entry hall had a two-story-high ceiling and led beyond to a spacious living room, seven to eight bedrooms, various other nooks and crannies, and an attic full of old books, tanning chemicals and much bric-a-brac. Several rows of roses and large boxwoods stood close by as did apple, peach and cherry trees. The hill was covered with daffodils in the spring. Further down the hill was a kitchen garden with vegetables and herbs as well as more flowers. Willard Williams, my grandmother's long-time employee, would help tend the garden and care for the ever-present chickens. Willard would wring the chicken's neck when chicken was on the dinner menu. A barn at the base of the hill held two cows, Daisy and Buttercup. Willard taught my brothers, Joe, Jim and Bob, and me how to milk them. Fanny, my grandmother's cook, would pour some of the rich milk into the electric churn to make buttermilk, butter and cottage cheese. Apple cider was pressed by hand on the family cider press. For many years my grandparents welcomed Williams, Gaston and Robbins children and grandchildren as well as many friends from the Chattanooga Bar Association and local families plus old acquaintances from White County. Joe V. Williams was born in 1872 in White County, Tenn. His mother, Matilda Wallace Williams, was a member of a pioneer middle Tennessee family. His father, James Tate Williams, a noted Presbyterian preacher, operated the Cumberland Institute, where his young son Joe received his early education. A classmate described Cumberland's Debating Society as one where late in the afternoon you could hear the voice of some young orator ringing out over the still air from the spur of the mountain, only to be answered by someone on the opposite side of the question over on another ridge. Williams carried a love of oratory and politics throughout his life. The young lawyer came to Chattanooga in 1894 full of enthusiasm. In 1898, he went to Chicago as a delegate to the Democratic Convention, where he heard William Jennings Bryan deliver his stirring "Cross of Gold" speech. In 1905, he was elected county attorney and served for five years. In 1911, the Quarterly Court appointed him Hamilton County judge. During his term the current county courthouse was built. He served until the next regular election on 1912, when he retired and supported his friend Will Cummings for the post. "Judge Williams" ran in the Democratic primary for U.S. Congress in 1912 but lost to long-time incumbent Rep. John A. Moon. He returned to his law practice and entered the National Guard during World War I. In 1924, he went as a delegate to the American-British Bar Association meeting in London, England, where in his stovepipe hat he and my grandmother were presented to the British royalty. He later served as president of both the Chattanooga and Tennessee bar associations. He belonged to the John Sevier Chapter of the Sons of the American Revolution as well as the Jonathan W. Bachman Camp of the Sons of the Confederacy. In 1937, the long-time Democrat spoke out against President Franklin Roosevelt's attempt to pack the Supreme Court. My grandmother, Annie Scholze Williams, was the daughter of German immigrants, who came to Chattanooga in the 1870s and started Scholze Tannery. Annie took an active interest in what became the Chambliss Home, the PTA at Normal Park School, the Boy Scouts, and First Presbyterian Church. She was one of the founders of the Union Chapel (the Little Brown Church) on Walden's Ridge. She organized the first junior garden club in Tennessee and took great pride in her own flower and vegetable gardening, for which she won many prizes. Grandfather died in 1947. My parents, Frank and Margaret Robbins, my brothers and I spent winters for the next five years with my grandmother at Oakmont. Grandmother died in 1957. Her daughter, Gertrude Gaston, and family lived there for 12 years until 1970. Oakmont stands today and serves as a clubhouse for the Mansion Hill Apartments. Frank "Mickey" Robbins is an investment adviser with Patten and Patten. For more, visit Chattahistoricalassoc.